You could pay $700 for a professional image-editing program like Photoshop ( ), but if you’re not a photo or graphics pro, it would likely be overkill. 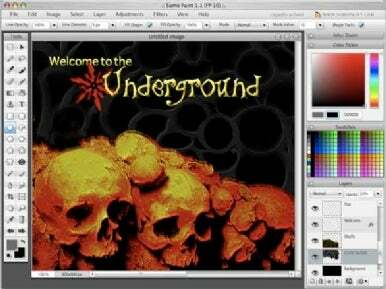 Check out Sumo Paint, a free Web-based, Photoshop-inspired image editor and creator that offers many similar graphics-editing tools and inspiring paint tools, first. Let’s say you’ve used Photoshop before but you can’t afford your own copy. You should feel right at home with Sumo Paint, as many of its tools and palettes work like Photoshop’s. A couple of caveats: some tools aren’t available, and some aren’t as in-depth. You can create a new document or open files from your Mac, a Web page, or your Sumo account (you’ll need one to save layered images); the app displays within your Web browser, letting you work and save projects much like you would on your own desktop. Any connection speed and browser that supports at least Flash 9 should work. For image editing, Sumo Paint offers many Photoshop standbys, including layer support, image adjustment tools (levels, color balance, and so on), blending options, layer effects (such as shadows, glows, and bevels), filters (including distortion effects, sharpening, and blur), a magic wand, and tools to transform and rotate layers, lasso selections, clone sections, draw, paint, add text, and more. Sumo Paint is a Web-based program with a Photoshop-like interface. And it's free. Sumo Paint is also a gifted graphics and painting app, packing in some interesting shape tools, cool brushes (the basics, plus fun stuff—like 3-D brushes and animated ones), and a Symmetry feature that makes designing elements easy. Explore the Gravity option for some intriguing effects. There’s also a nifty Curve tool, which works something like a simplified Pen tool, helping you shape rounded objects and corners more easily. Sumo Paint isn’t perfect: it works only with JPEGs, PNGs, and GIFs and saves only in JPEG or PNG format. I experienced some quirkiness with certain tools and layers, and the Text tool won’t let you edit copy once you lay it down. That said, Sumo Paint is a great free option for fixing photos, designing graphics, and painting, and I’m having a lot of fun with it.